It is undeniable the expressive skills of Langridge, especially with regards to his Muppet’s artwork. Abigail and the Snowman is a new book about a young girl moving to a new part of town and meeting a not so imaginary friend. Langridge’s pencilling strokes are so streamlined that only a few lines immediately set the tone and emotion of the comic. This is clearly a book aimed for the younger readers, which means the art is a little exaggerated and behaviours more amusing. What this cover brings is pure love and friendship, even if it depicts a child and a giant monster holding hands. The ability to draw a gentle but enormous character next to a small person is not easy and the way in which their hands are held is a prime example of Langridge’s skill. Her glance upward and massive grin is matched by the Snowman’s single line smile. His smoking pipe soothes the giant teeth abutting his beaming, and his single eyebrow is raised in joy very similarly to Abigail’s. The background may depict snow but it is an incredibly warm cover. The snow softens the houses and trees but it is the colouring that makes you feel warm inside. Stresing has a bright palette for the scene but has a yellow tinge to the pinks, red and brown of the central characters. It is almost as if the sun is shining atop this snow laden town. 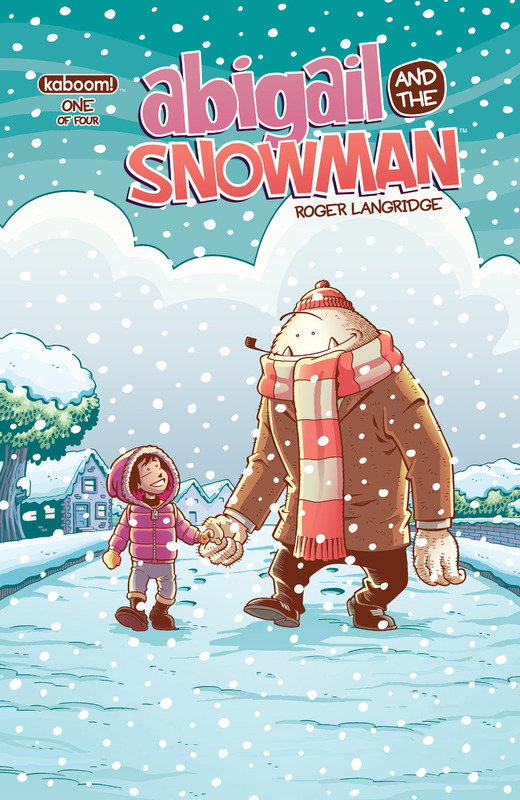 This accompanies the love between Abigail and the Snowman perfectly and completes this beautiful comic cover. Previous PostThe House of Flying Scalpels 2014 Comic Awards! Next PostThe Theatre List 24 & 31/12 – A double list to end the year!